Functionality, but OH, so much more. Be gorgeous - be brave, be timeless. Be bold, be sassy - buy the shoes, wear the hat! Be mysterious, be a head turner - Be You! 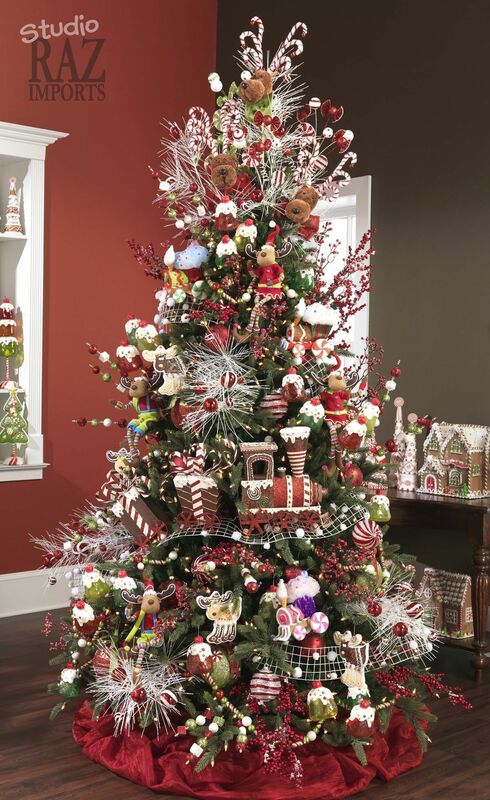 Okay - who doesn't just love beautiful Christmas Trees? From the wild & wacky, to traditional, fanciful and outrageously elegant. I adore them. I love looking at them, they just make my heart smile. Here are some of my favorites. Such creativity. Such imagination. But, isn't Christmas a time of wonder? Lovely! 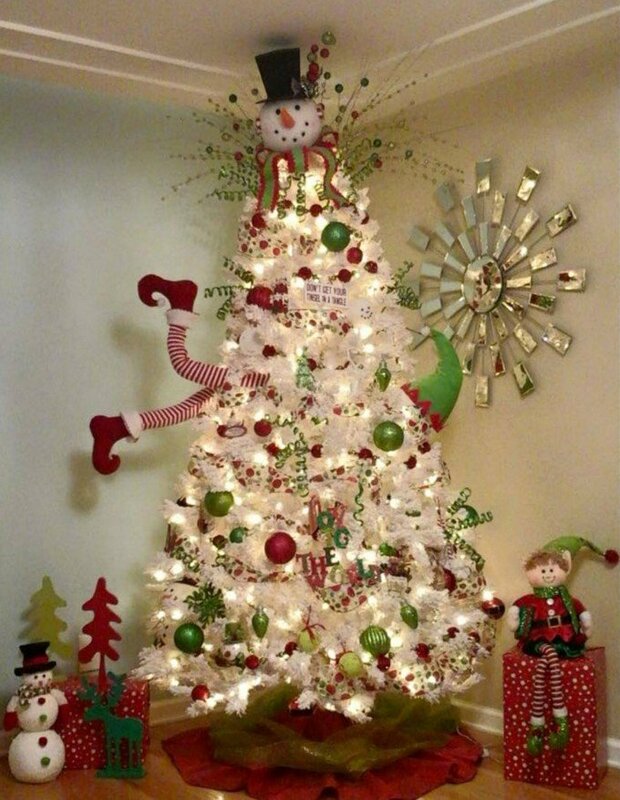 Talk about wacky & wonderful... this tree and an Elf stuck up inside the tree, coming out the other side. SO cute!! 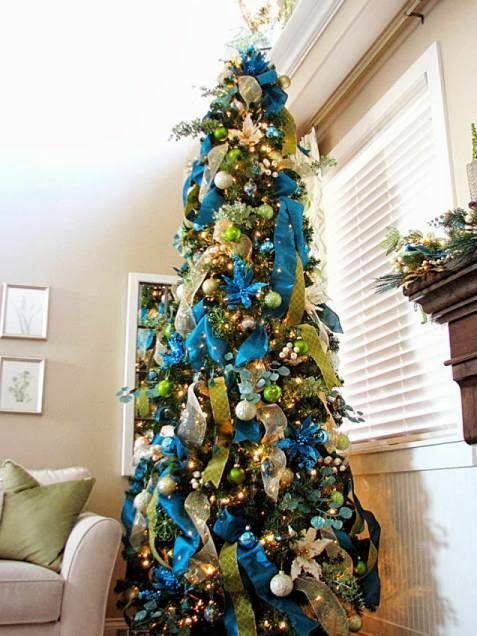 Lastly - I just love "blues", especially aqua blue. This one is precious. Christmas Bucket List - A Picture Says A 1000 Words! One day, I will experience this. What a picture, just wow! Nothing quite so lovely. Just stunning in winter's white! As my children have gotten older, you'd think that I'd have more of a "place setting" type of a dinner, now that they're all young adults. But, as the years have gone by, sometimes I'll have one or two of their friends joining in, it's turned into more of a buffet and casual seating type of an affair, sofa & comfy chairs, rather than the dining table. Wasn't it just a couple of weeks ago we were all Bats & Halloween? Where did this month go? Wow! I don't know if it's just me, as I get older - just stuff is like Whizzing by! Just Woosh! Summer, Labor Day, Halloween, now Thanksgiving. Well, moving homes at the end of September didn't help none! Took me three or four weeks just to find all my pots & pans, much less get ready for Halloween. Here we are half way thru November and I just found my other box of Halloween decor, and I'm like - OH, THERE it is!!! Now, it's Thanksgiving and I can't find my platters - oh my. I didn't put one pumpkin at my front door in October. Just, don't know. I couldn't get up the energy to doll up our front porch. I was drowning in boxes, paper and peanuts. Oh... yeah, still going thru boxes... do not look inside the storage closets. They're a disaster waiting to happen! But, I will have a simple & minimalist display out front, when my daughter comes for Thanksgiving. I can't NOT have decorated a little - she'll think I've had a nervous break down if she doesn't see something out front. LOL!! I am however, thrilled that I have found all my Christmas storage containers. Yay! I moved in October 1st, and I just found my Christmas boxes. Good timing. Happy and Blessed Thanksgiving everyone! as I was thinking on the whole bliss thing, I got to thinking on peace. I find my "peace"
me, daily. Bliss in infrequent at best and it rarely lasts for very long. just a moment of simply admiration... I was filled with peace. Him what it felt like for me to look at something so beautiful that only He could create. emotion and all I was doing, was driving to work! It was a lovely start to my day. something peaceful to enjoy. I believe that it's in the everyday & that it happens all around us. May God Bless you and may you Find Your Peace. Can't wait, just a few more days till it's officially FALL! Then, it's pumpkin time. 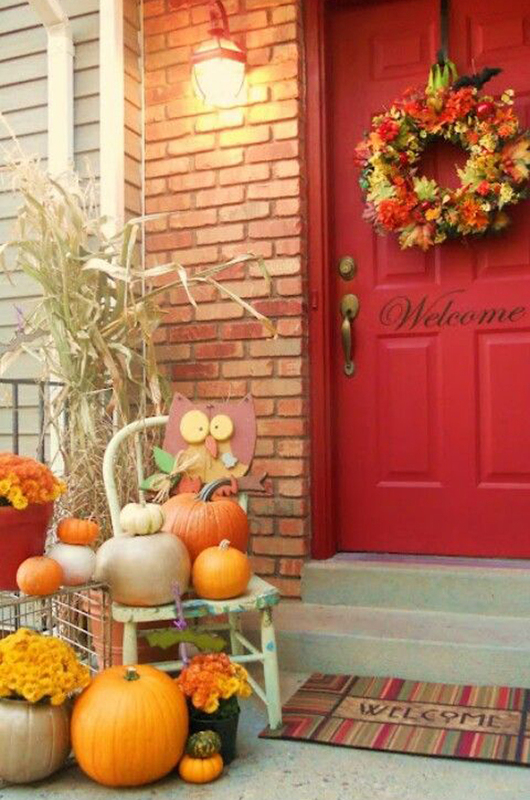 My front porch will get it's Autumn face lift. Here are just a few photos for inspiration. Topiary's are my favorite, just some green foliage and a pumpkin then - Wha Laa! This stairway is just about the same size as mine, but I would only be able to decorate the right side. Our left side has no rail or wall, so usually anything will eventually end up - down below. Sadly. 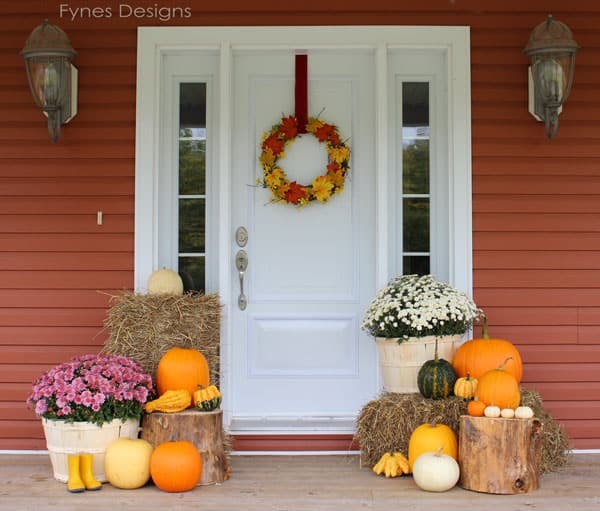 This last one is so pretty and so very simple - Orange flowers and pumpkins - my kind of easy. Hope you too, are having squash thoughts - LOL. Enjoy getting Fall ready! Just a pretty pic, as my thoughts wander to books, pink stuff and tea on this beautiful pre-Fall day. Light rains, gray skies and a wonderful smell in the air. The PNW Sound is beautiful with white choppiness as the wind blows. It's so beautiful in WA this time of year! Literally raining on this Monday. Here is a A wonderful photo taken from Owen's Beach at Pt. Defiance. And, who doesn't love to sit by a window, and read a book while you listen to the rain. It's one of my favorite peaceful pastimes. Give me a cup of Tea, a scone & a window. I Wish it had rained this weekend - how I would have loved to sit in my favorite chair. What a wonderful thing it is to smell the Fall rains. I am totally anticipating my favorite time of year!! Back in the day, tea cake typically referred to a delicate, light & airy sponge cake, orange or almond white cake or lemon sponge cake. Simplicity, I think was the style. Understated elegance. They were simple, pretty and amazingly delicious. They still are. They are always the best desert with Tea. Now enter the new Tea Cake - Literally! A TEA Cake, amazing! And, I just love them. I've never tried one but I long for the opportunity to see and taste one of these lovelies. So, I admire them from afar. having the girls over for Saturday tea kind of Tea Party? Just for the sake of having one of these beauties, I might actually be talked into it! I love this scripture which accounts for a moment in time in the life of Mary. Yes, there is mention of her in the bible, yet the mother of Christ is not spoken of often nor frequently. I like to imaging that she was a woman at peace with her life and calling. I like to imagine her as any mother, loving, nurturing, compassionate & giving. It seems that she was a thoughtful & wise woman as this scripture might attest to. Being wise to give contemplation to the things that she treasured and thinking of them, in her heart. "...but Mary treasured these things and pondered them in her heart"